The UW Retirement Association is recognizing Professor Emeritus Rob Crawford with the 2018 UW-UWRA Distinguished Retiree Community Service Award. Below are some comments from the President’s Office and nominators. 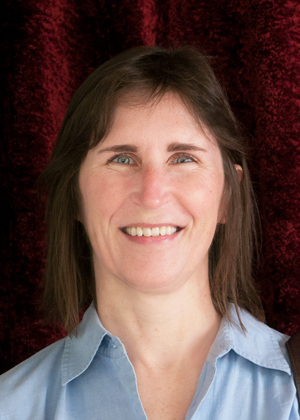 Congratulations to PPPA Associate Professor and Acting Director of UWT’s Asia Center, Dr. Mary Hanneman, on receiving a Fulbright Research Grant! Congratulations to Assistant Professor of Public Law Dr. Sarah Cote Hampson, editor of the newly published Mothers, Military, and Society, out this year from Demeter Press. Dr. Hampson’s “Military Moms in the Spotlight: What Media Attention on Mothers in the U.S. Military Means for Public Policy” is included in the volume. Congratulations to Dr. Compson and Dr. McGuire! Celebrate these newly tenured faculty by getting to know them a little better, including a preview of their current and upcoming projects. Dr. Compson has taught at UW Tacoma since 2012. Her specialties are applied philosophy, environmental ethics, philosophy of religion and the environment, comparative religion, and Buddhist thought (phew!). Dr. Eric Bugyis, lecturer in religious studies for IAS, is on a fool’s errand. He could have been a doctor. In his first month of medical school and with his whole future planned out ahead of him, he had what he now describes as “one of those 3am ‘what am I doing with my life?’” epiphanies. 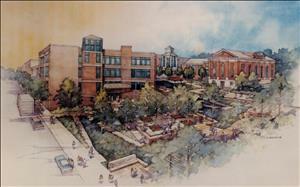 Ever wondered about UWT’s history? Wonder no more! Professor Charles Williams and librarian Justin Wadland recently collaborated on an essay detailing the history of the UW Tacoma campus. The essay is now published on Historylink.org (The Free Encylopedia of Washington State History) and is available to all online. Read about the establishment of the campus, the first classes held downtown in 1990, and the eventual expansion of offerings from one single upper-division Liberal Studies program to its current full range of undergraduate and graduate offerings across seven programs and schools. Congratulations, Charles and Justin. “Understanding Ethnic Conflict at Home and Abroad,” is the topic of our Fall Quarter Global Classroom. 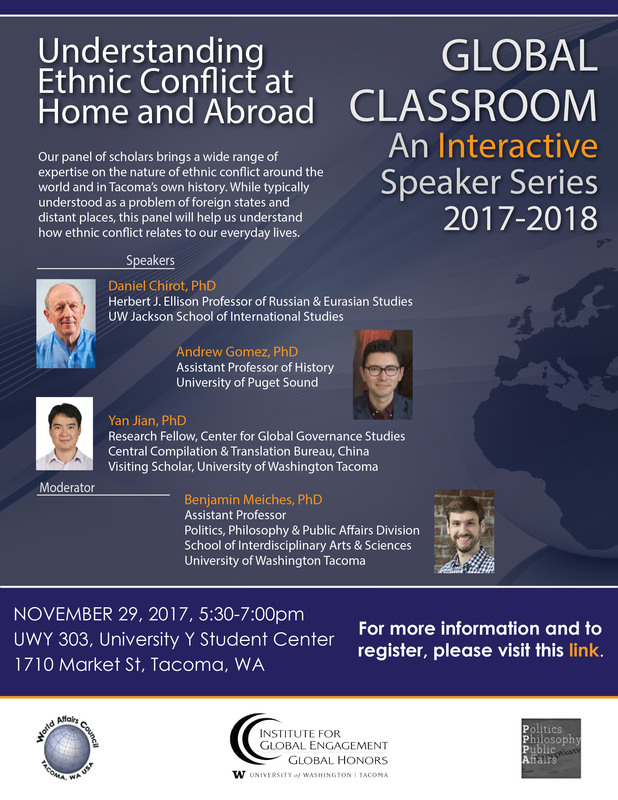 Jointly hosted by UW Tacoma’s Institute for Global Engagement (IGE), the SIAS Division of Politics, Philosophy, and Public Affairs (PPPA) and the World Affairs Council Tacoma, Global Classroom is an interactive speaker series on global issues that matter. The flyer is attached, please join us! 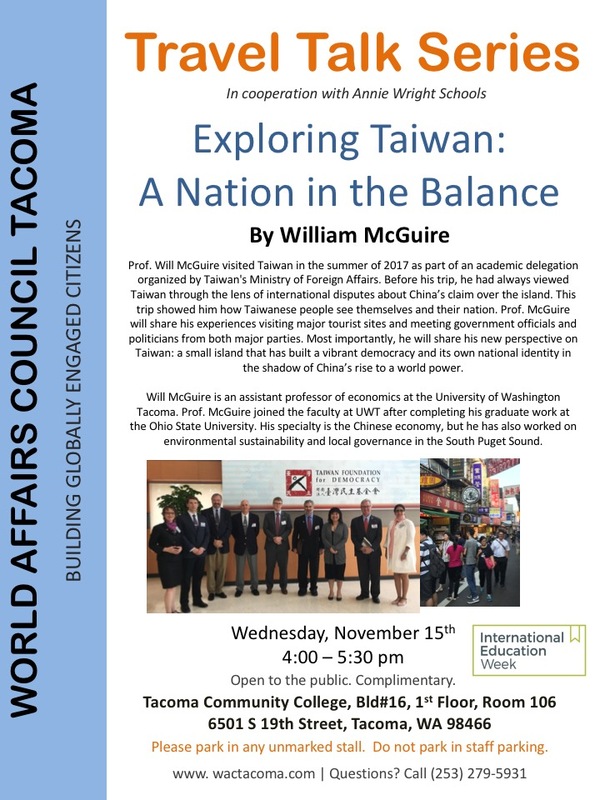 Join World Affairs Council Tacoma, Annie Wright Schools, and our own Will McGuire at Tacoma Community College on November 15th, 2017. The Travel Talk Series will feature Will’s summer 2017 experiences in Taiwan. This year, the Division of Politics, Philosophy and Public Affairs is pleased to be hosting Dr. Yan Jian (left) as a visiting scholar. Dr. Yan earned his Ph.D. in Political Science from Beijing’s prestigious Renmin University in 2012. Since 2005 Dr. Yan has been a research fellow in the Center for Global Governance Studies in China’s Central Compilation and Translation Bureau, where he has translated numerous political science books and journal articles into Chinese. 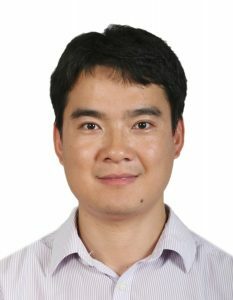 Dr. Yan’s current scholarly focus is on failed states in Africa and he has published more than 20 articles in this area. 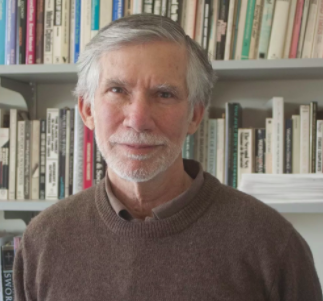 This interest was sparked by a particular conversation with his dissertation advisor, Yu Keping, author of the famous essay, “Democracy is a Good Thing,” that led Yan to consider why it was that a number of contemporary African states seemed to be worse off than during their colonial period. While at UWT Dr. Yan will continue his research on this topic. He has already delivered one informal “brown bag” talk on his research; stay tuned for other seminars by him over the coming year. Dr. Yan is accompanied here by his family. Wife Jia Yajuan is the English editor of The Journal of Modern Chinese History. Five-year-old daughter Beixi (“Bessie,” whose favorite color is pink and whose favorite animals are dogs) is bravely integrating into kindergarten at a local elementary school. The family has already made a habit of exploring Tacoma’s local parks and playgrounds and looks forward to continuing to learn about the local area and beyond. “Someone” has promised that the Tacoma winter will be milder than in Boston, a city where several years ago Dr. Yan and his wife spent a winter. Let’s hope so! Dr. Yan’s office is on the second floor of Keystone. You can reach him at yanjian@uw.edu. 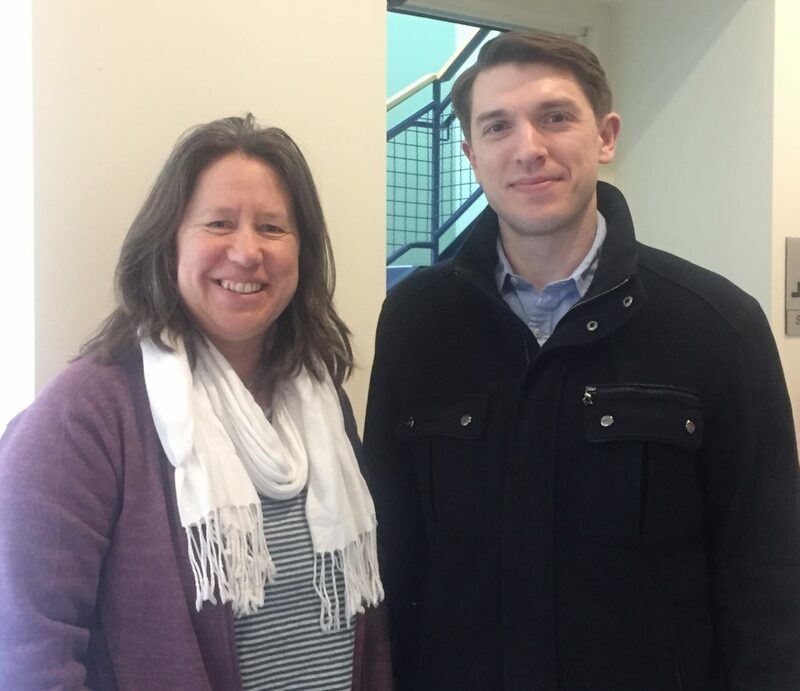 Ernesto Chavez (left) joined our faculty this fall as a Lecturer in Law and Policy; he is also the campus’ new Pre-Law Coordinator. 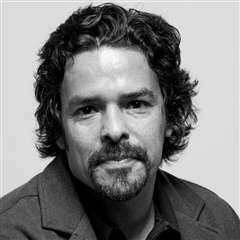 Prof. Chavez comes to us from Saint Martin’s University where he taught courses in Criminal Justice and Legal Studies. Prior to Saint Martin’s, he spent fourteen years as a criminal defense attorney after receiving his law degree from Indiana University, Bloomington, As our Pre-Law Coordinator, Prof. Chavez will be supporting UWT students aiming for a law-related career. This year, in conjunction with the Teaching and Learning Center, Prof. Chavez has initiated the Law School Application Success Series, a series designed to help students navigate through and succeed with their law school applications. The series will include UWT’s first ever slate of LSAT preparation classes. Please join Prof. Chavez and the TLC for its kick off event on October 11th.